Middletown Genies is an very informal group that gathers to discuss how our individual genealogical research is progressing on a month to month basis. Pension Research: You Stopped Too Soon by Craig Scott. Most just touch a pension application file. But there is so much more. There is pension law, application files, pension ledgers, payment vouchers, last and final payments. Genealogical Society meetings are held at the Rockville Senior Center, 1150 Carnation Dr., Rockville, MD. Call 240-314-5019 for directions. There is ample free parking. We request a voluntary donation of $5.00 from non-members. If Montgomery County Schools are closed due to weather, we do not meet. 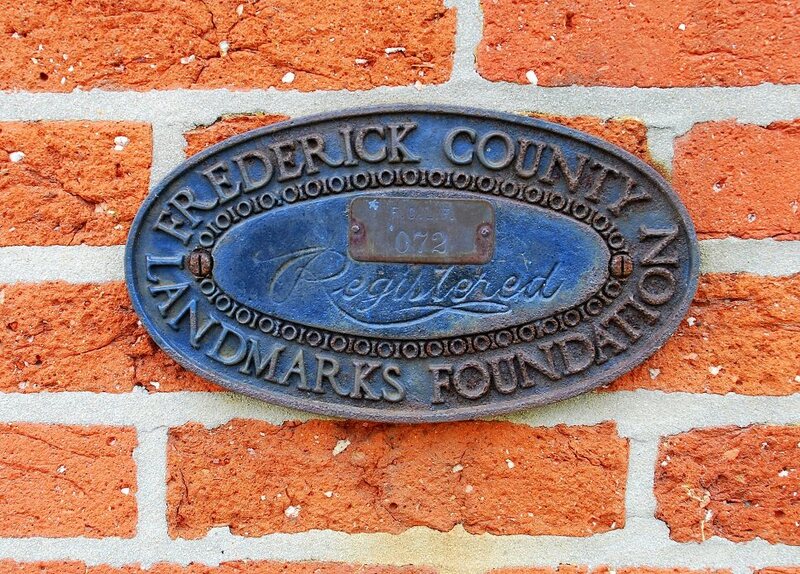 Introduction to the Frederick County Landmarks Foundation's Plaques program, followed by an introduction to house and property research. Co-sponsored by Frederick County Landmarks Foundation and the FCPL Maryland Room. Maryland Room Manager Mary Mannix presents an overview of the resources, print and electronic, available to investigate family in other countries. Internet Archive, Google Books, and HathiTrust are giant digital libraries of books available at no cost. Among the thousands of books available are many that can be used in genealogical research. A team of local librarians, including AAGS President Carol Carman and First Vice President Cynthia Steinhoff, will provide an overview for each collection, offer searching tips, and give examples of research conducted in these valuable online libraries. Other smaller collections of digital books will also be discussed. Go to https://www.aacc.edu/about/locations/ for directions to Anne Arundel Community College and select "Directions to West Campus." A campus map is available at this site. Parking is available in Lot F, across West Campus Drive from the Cade Center. Beverages will be served at the seminar. Register below using Paypal or credit card. 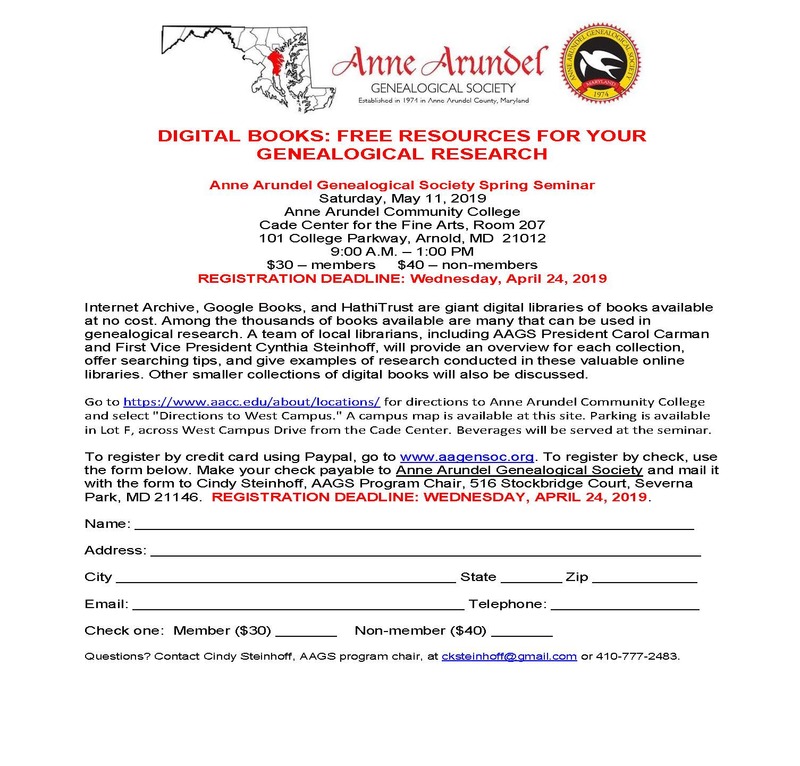 To register by check, download and fill out the registration form, and mail it with your check, payable to Anne Arundel Genealogical Society, to Cindy Steinhoff, AAGS Program Chair, 516 Stockbridge Court, Severna Park, MD 21146. 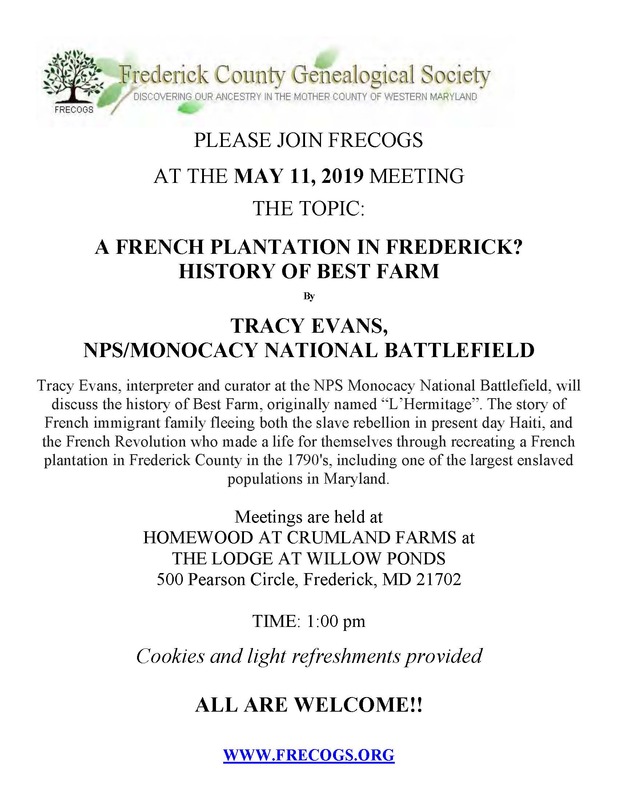 Tracy Evans, interpreter and curator at the NPS Monocacy National Battlefield, will discuss the history of Best Farm, originally named “L’Hermitage”. The story of French immigrant family fleeing both the slave rebellion in present day Haiti, and the French Revolution who made a life for themselves through recreating a French plantation in Frederick County in the 1790's, including one of the largest enslaved populations in Maryland. The Historic Document & Photograph Care Workshop will teach proper methods of caring and handling of your heirloom photos, photo albums, books, and documents. The presentation will provide tips that people can use in their homes to help preserve and protect their heirlooms for future generations. Ancestors in the US Military: Online and in Military Archives by Margaret McMahon. Learn how to use online resources to locate information about your ancestors’ US Military service. The discussion will include information about how to use military archives in your research.